"Far from being the source of anti-Americanism in Turkey, the AKP represents an ideal partner for the United States in the region." So asserts Joshua W. Walker, a former Turkey desk officer at the State Department now studying at Princ­eton University, referring to the Justice and Development Party (known as the AKP). Writing in The Washington Quarterly, Walker supports his thesis by noting the constructive Turkish role in Iraq, praising "how carefully the AKP has guarded the [U.S.] alliance and tried to work with the Bush administration, partic­ularly when compared to other European nations." Not just that; he welcomes the weakening of Turkey's secular establishment, which he disdains as having "succeeded for decades in defining secularism in such a narrow way as to safeguard the outmoded and repressive antidemocratic features of the Turkish state." Recep Tayyip Erdoğan (center), then-chairman of Turkey's AKP, meets in the Roosevelt Room of the White House on Dec. 10, 2002, with President George W. Bush (right) and then-Secretary of State Colin Powell. This analysis, in "Reexamining the U.S.-Turkish Alliance," throws down the gauntlet for someone like myself, who appreciates the secularists' long run and suspects the AKP of being an Islamist organization that seeks to impose Islamic law (the Shari‘a) and perhaps overthrow the secular Atatürkist order to create an Islamic Republic of Turkey. New realities require a painful reassessment and giving up the warm sentiments built up over a nearly 60-year alliance. Bold steps are needed to bring the country back into the Western fold while blunting the damage an Islamist-led Turkey can do to Western interests. Although all Western governments currently share Walker's easy accommodation and even enthusiasm for an increasingly hostile Turkey, their soothing words and glib assessments must not be allowed to conceal the dangerous developments now under way. Walker helpfully provides evidence of those new realities. To begin with, anti-Americanism has prospered exuberantly in the five years of AKP rule, to the point that Turks regularly poll as the population most hostile to America in the world. In 2000, polls show, 52 percent of them looking favorably on the United States; just 9 percent do so in 2007. The government of Recep Tayyip Erdoğan and Abdullah Gül indisputably helped foster what Walker calls a "long-term slide into an anti-Americanism that cannot simply be erased with a new U.S. president in Janu­ary 2009." The catalytic event, now emblematic, was the Turkish parliament's March 1, 2003, vote not to allow American forces to use Turkey as a staging ground to attack Saddam Hussein's regime in Iraq. This refusal bred mutual suspicion and excluded Ankara from decision making about Iraq, an exclusion that had great consequences when the Kurdish Regional Government took power in northern Iraq, permitting an anti-Turkish terrorist group, the Worker's Party of Kurdistan (known as the PKK), to use Iraqi territory to stage attacks on Turkish interests, inflaming Turkish public opinion. 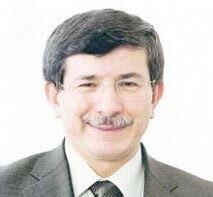 Ahmet Davutoğlu, Erdoğan's chief foreign policy and creator of the "strategic depth" doctrine. The development of a dramatically new foreign policy doctrine, dubbed "strategic depth," one that calls on Ankara to emphasize relations with neighbors and lessen dependence on Washington, also created tensions when its primary advocate, Ahmet Davutoğlu, became Erdoğan's chief foreign policy adviser. Walker acknowledges that "This type of policy does not bode well for the historic U.S. alliance." Ironically, these problems are to some extent self-inflicted, for the Bush administration, in an early application of encouraging lawful Islamists to be elected to power, in late 2002 helped Erdoğan stabilize his then-shaky legal position. That's when, breaking with precedent, the president met him – only a party leader at the time, not a state official – in the White House. In Walker's estimation, this sent "a clear signal of support from the Bush administration for Erdoğan and the AKP government." Along with Japan, Turkey has shown itself to be among the most malleable of countries. In just fifteen years and almost single-handedly, Atatürk managed to move the country Westward; in just five years, Erdoğan has started moving it Eastward. The recent transformation has happened so quickly that – formal NATO relations notwithstanding – Turkey can no longer be considered a Western ally. Nor, certainly, is it an enemy. Rather, it falls into a middle status – like Russia, China, and Saudi Arabia – of rival. One day it cooperates, the next it competes. Before long, it may well threaten. External influences will have limited impact on a Turkey determined to turn Islamist, but existing tools must be fully deployed. Most importantly, an ideologically assertive Turkey must be denied membership in the European Union. Dec. 6, 2007 update: For more on this topic, see "Turkey as Rival." Related Topics: Strategic alliances, Turkey and Turks | Daniel Pipes receive the latest by email: subscribe to the free mef mailing list This text may be reposted or forwarded so long as it is presented as an integral whole with complete and accurate information provided about its author, date, place of publication, and original URL.